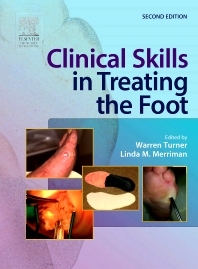 The eagerly awaited new edition of Clinical Skills in Treating the Foot has been revised and updated with the needs of a broad range of health professionals in mind. For anyone treating patients with foot disorders, Clinical Skills in Treating the Foot will provide invaluable support through three key areas: Section 1 is concerned with the general principles of managing foot disorders and the context in which treatment of the foot takes place. Included are chapters on treatment planning, evidence based practice, governance and audit, clinical protocols, clinical emergencies and health promotion. Section 2 examines the application of clinical therapeutics to foot disease and includes chapters on operative techniques, surgery and the foot, pharmacology, physical therapy, mechanical therapeutics, chairside devices, prescription devices and footwear therapy. Section 3 considers the particular needs of special groups and includes chapters on the adult foot, the child's foot, sports injuries and management of tissue viability. With its clarity of text and liberal use of case studies and illustrations, the latest edition of Clinical Skills will be required reading for practising and student podiatrists. It will also be a valuable reference and guide for all others involved in the provision of treatment of the foot. This book has been written as a companion volume to the editors' Assessment of the Lower Limb, also published by Elsevier Churchill Livingstone.